Features on new cars have taught us to be really terrible drivers. I haven’t looked over my shoulder to go backwards in three years (reverse cam) and I drive a truck. I was driving in a colleague’s Mercedes Benz and he doesn’t have to do shoulder checks because his car tells him if someone is in his blind spot as soon as he turns on his signal. Parallel parking is a lost art form, with entry level cars performing the task for you now. All of this is wonderful until that exact moment one of those systems fails you and you are out of practice with it. This happened to my colleague with the Mercedes Benz, he was rear ended which broke his sensor on his backup cam and he forgot it was broken. The next time he backed up he hit a pole, further damaging his bumper. Things become automatic and it is hard to get out of habits. This is how I am feeling in The Secret World. Modern day MMOs have spent so much time conditioning me to be stupid in questing in games that it is hard to break out of the mold. My body was having an adverse reaction somewhat – thinking? You want me to THINK in game? no no.. find the shiny breadcrumbs! If they aren’t there, download a mod with them. I refuse to THINK while gaming! Rest assured, I haven’t lost it. It is just a bit uncomfortable – completely in an amazing way. 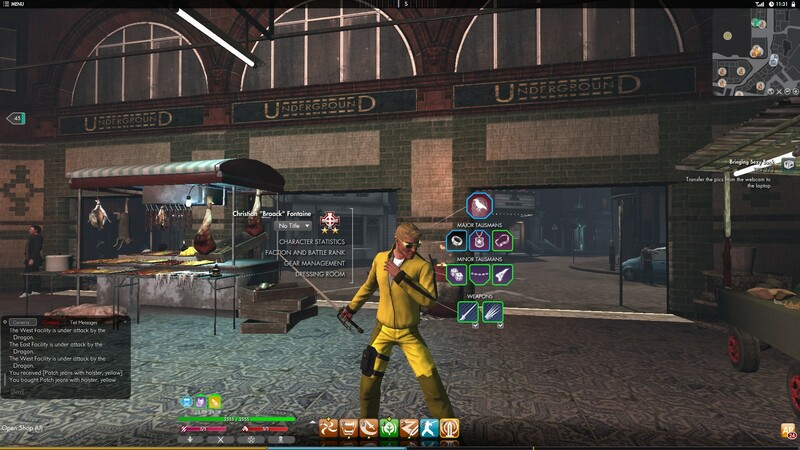 It is fun to getting back to thinking and using some research and head space while gaming.The Secret World is now my go to game, and I still have so much to learn. I just finished every mission in Kingsmouth (except the group instances.. all old MMOs should patch out group missions after their game is 2+ years old and/or make them solo-viable) and the times where I had to go spoiler sites did cause me to /facepalm here and there. Things are only obvious when you expect them to be. Thankfully I am unlearning my bad habits and getting into the flow. My Character Sheet is here and after I finished the Champion starter deck I got a nice, free Kill Bill-esque style jacket so I went shopping to match out the outfit. Swanky! Truth be told, there is something about shopping in this game that is oddly fufilling – even moreso than real life shopping. Perhaps it is because I couldn’t walk around with a rapier in the real world while doing so. The new challenge for me as I venture into the Savage Coast is sorting out how to properly progress. I have blown most of my cash on clothes, but I have a ton of Sequins of Solomon Island that I should sort out what to with. I have also broken down every single non-upgrade item so I am sitting on 25 of 50 inventory spaces with crafting mats. I am still getting through quests without trouble with my almost standard Templar – Champion Deck (I added a single target blade attack to help with big, single mobs). The challenge for me right now is I have 25 SP and 100 AP and I don’t know if I should be rounding out more inner wheel items to be better prepared, or starting to explore into the outer wheel. I do know I eventually want to fill out the Preacher Deck (for the outfit, plus I already have some Blood Focus abilities) and also the Paladin Deck – but I think I am getting way ahead of myself. People always talk about roadblocks and tough areas in TSW so I am cautious to spend points when the game isn’t forcing (or even strongly encouraging me) to do so. The Secret World launched when I was raiding in WoW which is why I skipped out on it at the time. It is nice to be discovering it now, so expect more posts on the subject. It is also nice to have a single game to be excited to login and play again. I am looking forward to exploring group play and maybe actually getting in game with people I know. There has been some life in Kingsmouth which is good to see and two different role players have interacted with me on different occasions (I am on a RP server). All in all, this has been a great experience and I am finally starting to understand the good things people have said about this game over the years. Nice to experience it for myself. Looks like you’re going blade.fist, so….. what I would suggest with your SP is to get all of your talisman skills to 4 (which will use 11 of the 25 banked) and then also get your blade and fist damage lines to 4 as well, which will use another 11 points and thus eat up 22 of the 25 you have banked, leaving 3 to save for upgrading each of those 5 skills to level 5. . . .
For your AP, absolutely fill out the inner ring. If you don’t know where you want to fill…. I’d grab the Elemental Force from Elemental, and then blood in order to get Iron Maiden low in the outer ring. That pen chance buff it gives is yummy! You could also look at getting Turn the Tables from the green miscellaneous line at the top of the wheel. You get “SoH” (Sleight of Hand) on the way there, which is a cc-breaker which can be a big lifesaver at times too — generally for certain bosses in certain dungeons. Sorry for the double-post….. forgot to mention: The *only* reason to get the skills for the decks that the factions suggest is to gain the outfits. The decks themselves are pure garbage. Make your own, or look something up on tswdb.com or something, but for the love of God do NOT actually use the decks……. Since the recent combat changes, they may not be quite so bad, but I’d be willing to bet that “non-optimal” is still probably the best that anyone could say about them. Arg! Triple post becuz something else just occurred to me…..
FWIW, you will eventually fill the 2nd line on your weapons too, but while in the early leveling process, it’s better to focus on the single line (almost always damage) in order to allow you to use the higher QL weapons faster. I have an interest in playing with some other thinks (AR does thenmatically, as does pistols) so I think I will hold off on spending my SP until I get items that require it (for example – I got the nice Head Talisman so had to spend there). Does AP MAX at 99? I think I got stuck there……. anyway, it is so interesting to see how things work together. I am just sorting this out. Making a post on it – too long to post here! Thanks for the great advice though! SP Maxes at 35 until you start doing AEGIS stuff in Tokyo, then the cap slowly raises as you buy the AEGIS skills. AP caps at… I want to say 175 (a big IIRC there), but then as you put things into the Augments then it also raises up until 525 becomes the cap. And on what deck to collect: don’t go for either of the “big” decks before you have a solid setup. The beginner decks are usually (even more now after the rework) a quite good foundation. The advanced decks, on the other hand, were in the game since launch and actually are not really adviseable. They show some ways of combining effects and using synergies, but next to that, they’re only good for getting the outfits. 1. Take a look at 12 gouge from shotgun. It’s a passive so it can be used with any weapon, and it stacks up on the enemy to -30% damage. Very useful. 2. Make sure your penetration rating is sufficient for the content you are doing. Dark Prophecy and Iron Maiden (from Blood) are very good choices there, with Iron Maiden being the stronger choice. 3. For that you’ll need a reliable way to debilitate. If your chosen weapons do not supply that, you might want to use Bloodsport from fists. 4. Have some way of healing. If one of your weapon provides active healing, great. If not, consider including Lick your Wounds from Blood and/or Immortal Spirit from Blades. 5. In case of doubt on the elite passive, i would use one of the inner wheel passives from blade, hammer or chaos. My personal preference is Fluid Defense from Blades, especially if you have good penetration rating. 6. If you use Blade, Hammer or Chaos as your main builder, you might want to bring a way to put exposition on the enemy, too. For Blade or Hammer you want Breakdown from Chaos in your setup, if you run Chaos, you have more options. Great advice here – thanks! I am actually forming another post because I just sorted something out that I have been using that is actually really awesome, but I didn’t even know that – and it is all base from the Champion deck. The complexity of this system is crazy, and you need some sort of calculator or program to really understand. Stay tuned for that post in the next day or so =) Thanks for the suggestions! I did not know that – thanks! Will definitely join there. That’s exactly like i was at the start and it does take a while to relearn those habits of play. To just take the time while completing quests. write stuff down, think.. learn. It feels rather rewarding in the end too. Yeah, my wife “Scooter” and I bought little moleskin notebooks for the investigation quests and remembering other details. The pocket size is handy and has the added benefit of being something your character might have with them. HAHA! I have only spent my SP I as I have needed it (to equip an item if I can’t) so I have plenty left. I didn’t realize stacking it early still gave benefit (although that would make sense). Far more rewarding. The times you cheat (well, the times I cheat – because I do if I get stuck for too long..) and when you get the solution its usually a face-palm I should of thought of that moment. But as I learn more, I get far better at it.